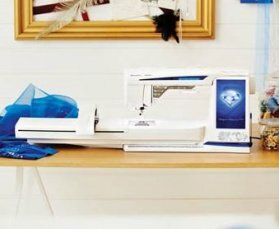 The DESIGNER DIAMOND Royale™ sewing and embroidery machine from HUSQVARNA VIKING® delivers brilliant results. It’s completely intuitive and includes innovations only found on this machine. What’s not to love? 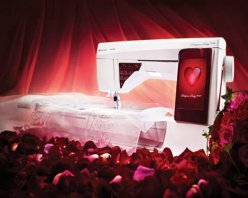 Designed and engineered in Sweden, the DESIGNER RUBY deLuxe™ sewing and embroidery machine offers a wide array of features to fulfill your heart's desire. The journey begins as you see, touch and customize your embroideries and stitches on the vibrant Large Interactive Screen. Once you start sewing, you will discover more benefits from our leading edge technology hidden in the heart of the machine – the deLuxe™ Stitch System. Includes Innovations such as Husqvarna Viking's exclusive SEWING ADVISOR® feature and the EXCLUSIVE SENSOR SYSTEM™ technology. 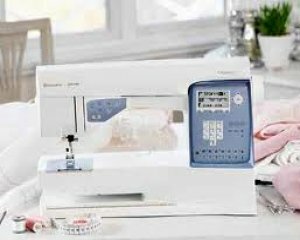 The SAPPHIRE™ sewing machines bring you ease and convenience with state-of-the-art, time-saving features.